Thursday 26 April. Rest day and walk to Orgiva. Weather today was sunny and warm with temperatures reaching 23C. Today was a rest day with no cycling planned. Most of the group went on a walk down the valley into Orgiva, either there and back or getting a bus back. I had a total rest sunbathing beside the pool and blogging and reading. 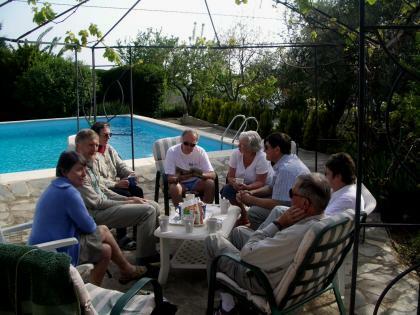 Everyone returned by mid-afternoon and had a relaxing tea beside the pool. Ann, Nicola and Phil braved the still cool temperatures of the pool. The evening meal was on the patio looking out over the valley as the sun set. Wednesday 25 April. Ride to Trevelez. Weather today was overcast but dry with temperatures reaching 20C. The ride today was east and then north into a valley reaching down from the high Sierras to the white village of Trevelez the highest village in Spain at 4850ft. Some rode the entire route while some were car assisted part of the way and some had a lift all round. Today's main meal was a picnic at Trevelez. I had originally intended to ride the entire route but a problem with my chain which took a while to fix forced me to get a lift to 11s at Pampaneira. This was probably just as well as after yesterdays exertions a similar amount of climbing today would not have been good for my back. At Pampaneira our host Ann took us on a walking tour round the village including a weaving shop and views of local chimneys which looked like they had hats on. After elevenses we all rode on together with Ian stopping occasionally to check everybody was ok and didn't need a lift. We rode through more white villages before heading north up a valley cut into the high Sierras. We reached 5080ft before descending to Trevelez. The picnic was all set up ready for us on a green beside the river and bridge. After lunch there was a little more climbing before cresting a ridge and a long whooshing descent down 2800ft to the Orgiva valley. We stopped for tea at a bar in Torvizcon. Then another long descent to Orgiva Bridge. Here I joined Mike and Richard for a lift from Ian up the long climb from the valley floor to Lanjaron and then up the hill back to base. My ride even with the lifts was 38 miles and 3854ft of climb. Nobody doing the full route had a bike computer but my estimate is 57 miles and 5800ft of climb. Wednesday 25 April. Walking tour of Pampaneira. Tuesday 24 April. 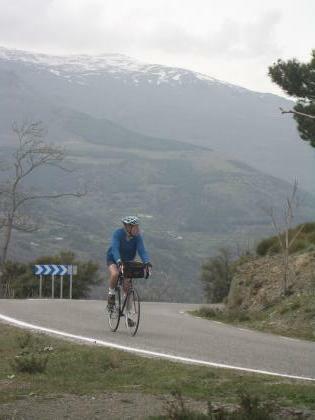 Ride up the Pico Veleta road. Today weather was perfect with clear blue skies all day and temperatures up to 24C. 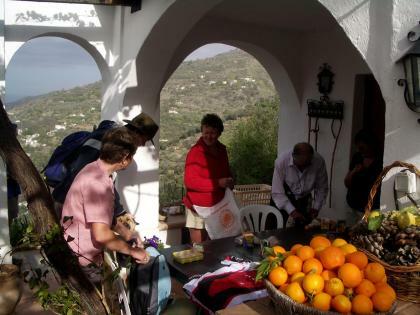 Our driver Ian runs a cycle tour business in the area associated with the accommodation provided by our host Ann. Ian and his nephew James joined us on the climb on lightweight road bikes. We unloaded the bikes about 5 miles up from Granada and about 200 meters in height above the city. April is too early to get all the way to the top and we planned to go as far as possible before the road was closed. My injured back was improved enough for the climb but taking it steady at a slow pace which Ernie was happy to join me in. Young James sprinted ahead and Phil and Ian rode on ahead with Ian sometimes riding down to see how we were doing. 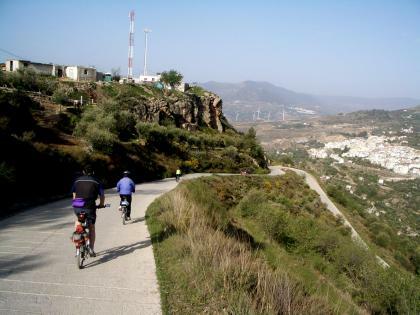 The suburban towns south of Granada gradually got smaller below us among serrated ridges and a lake. We had an early start and had started climbing about 9.00. After about an hour we regrouped at caf? for a pleasant stop in the warm sun. We continued and the road climbed higher crossing to the western side of the ridge with Granada tiny in the distance. I had cycled the entire route previously in 1989 but then the middle part of the climb was in mist as we rode through a cloud layer later emerging above the clouds. This time I was able to see all I missed before. The snow covered peak of the Pico Veleta was soon visible ahead of us. We passed a broken rock bridge over the road with snow-capped mountains visible behind it. Ian came back down and took some pictures of Ernie and myself cycling up using my Camera. 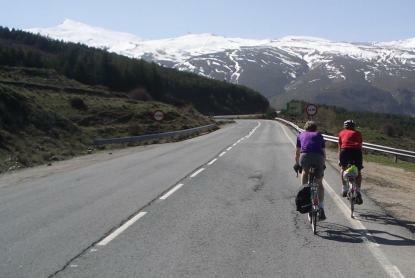 We continued on and up to the edge of the Sierra Nevada Ski village and the road looped round and above it passing the Auberge Univeritario where our group stayed on the 1989 visit. Then on higher to a closed road barrier which we went round as bikes are allowed. We stopped at the "Our Lady of the Snows Statue" where there was a view of the Pico Veleta peak through the triangle of the base. 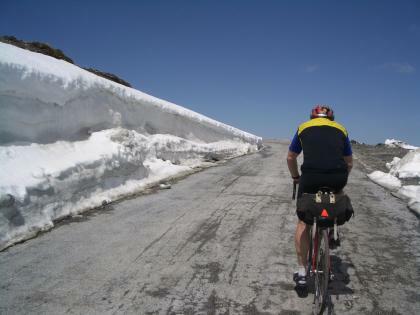 We had reached the first snow at the town and as we climbed higher there were sometimes walls of snow beside the road. Our highest point was at 8600ft about 2500ft and about 5 miles short of the summit. We descended to a caf? just below the statue for a coffee and picnic lunch in the sun which was pleasantly warm even at our great height. Our 17 1/2 mile climb had taken about 4 1/2 hours. The fast swooping descent took 35 minutes. We returned to base to relax by the pool. The main group had a good visit to the Alhambra Palace with a lot to see and do although they had to queue over 2 hours to get in. 35 miles for the day and 6069 ft of climbing. Tuesday 24 April. Edwin and Ernie, photo by Ian. Tuesday 24 April. 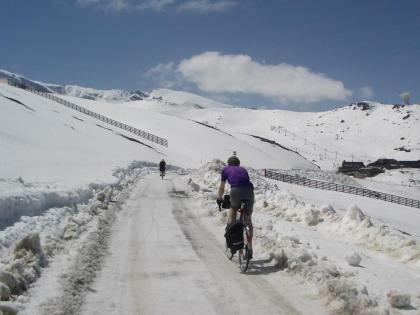 Ernie and Phil cycling through snow. Tuesday 24 April. Alhambra group tea by the pool. Weather today was very good with clear blue skies and temperatures up 23C. There were 2 rides a medium one up to Niguelas to the NW on which most people went and a longer ride led by Phil and Mary and joined by Ann and Gill. On the medium ride there was Richard, Edwin, Mike, Jim, Alan, Liz, Avryl, Ernie and Nicola. Mike borrowed Phil's bike which he keeps in Spain and Jim was on a very lightweight hired road bike. Both groups stayed together down to the Motorway bridge. Going through town my chain snapped requiring use of my chain tool to repair. 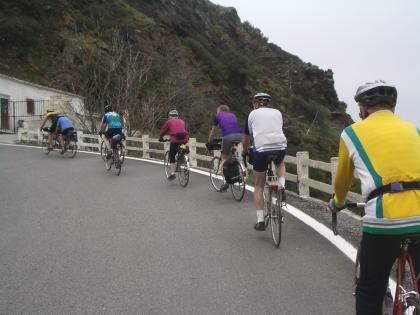 We headed down the hill and took a minor sideroad closed to traffic due to a landslide which we wheeled the bikes over. Then a gentle climb to stop at a bar for elevenses at Lecrin. 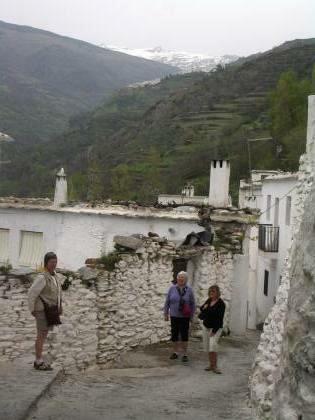 Then on up to Niguelas a quiet town at the base of the mountains. We stopped for a picnic lunch in the Garden Romantic , some gardens next to local Council offices. We noticed a giant sized grasshopper on a hedge and Ted posed for pictures beside it. We headed back on another road adjoining the motorway and went to view a Roman Bridge. 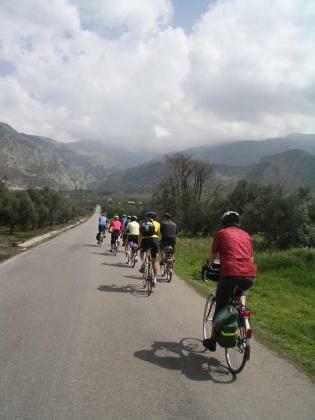 Then back up to town where we met up with the riders on the longer route. Then the climb back to base and tea on the terrace looking down on the valley in the warm sunshine. 26 miles for the day and 2677ft of climb.